Before I built my own studio, I studied studio design techniques and noticed a wide discrepancy in the way professional studios, many of which I work in regularly, were built. 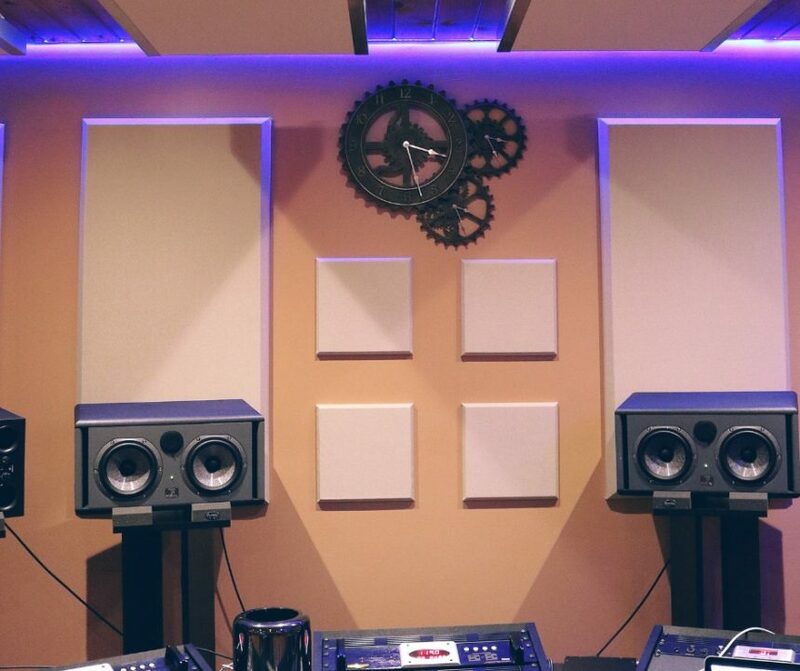 I remember a session in a world-class studio with completely redesigned and recently remodeled rooms. It looked great, the control room was true (for the most part), and the whole vibe of the studio felt very confortable. I also noticed that the wall dividing the control room and the studio was about 3’ thick, with the usual rectangular window installed within. While the clients were listening to the mix, I decided to wander around the newly designed live room. I walked into a side room used for vocal overdubs and out its back exit, shutting the door behind me, to enter the live room. Hmm, I thought sarcastically, nice isolation-when I heard the Yamaha NS-10 monitors bleeding loudly through the glass between the rooms. With a 3’ wall, it made no sense that the NS10s were audible. These are, after all, close field, bookshelf speakers and not giant primary reference monitors. I examined the way the glass was fitted into the window (actually two windows, mounted o each side of the wall) and realized why the seal wasn’t working. The glass was attached directly to the wood, with a bead of silicone sealant around the baseline. The same was true for the sheet of glass on the other side of the wall. I had seen this design many times before, but never had reason to question it until now. This technique didn’t make sense because the vibrations would transfer from the wall to the glass (and back). The 3’ wall basically had a huge hole in it, which made it quite ineffective. Another problem was apparent in the door seals, or lack of them. Although the studio has installed thick wood doors, hey were left with about a 1/2” gap at the bottom. They were like regular doors that you see in a house, with no sound-isolating material around the threshold. These fundamental isolation problems had been overlooked in the construction of this multi-million dollar studio (which otherwise is one of my favorite studios in New York). When I was designing my studio, I picked up a book called How to Build a Small Budget Recording Studio (2nd edition, July 1988, Tab Books) by Frederick Alton Everest, Alton F. Everest, and Michael Shea. One of the authors, Mike Shea, happened to be a former teacher of mine at New York’s Institute of Audio Research (IAR). He agreed to come down to y studio before construction and give me some advice, which turned out to be invaluable. Mike gave me a rundown on the proper way to install internal windows. The secret to success lies in mounting the glass properly. Many people working in a commercial recording studio for the first time notice that the panes of glass in a control-room window are angled. There are two reasons for this: the first is to control reflections. When the glass is straight, reflections bounce back and forth between the two panes. You sacrifice the integrity of the seal, get standing waves, and end up with a completely reflective surface inside both rooms. The second is to avoid the mirror effect (which lures musicians into looking at themselves, when they should be watching the engineer)-it can be quite distracting! Whether or not you decide to angle you windows, it’s relatively easy to seal them effectively and professionally. To prepare the window area for the seals, first you need to frame the inside of the window with wood. Use a level and make sure the surfaces are smooth and even. Use clear silicone to fill in any gaps in the wood. You’ll need some wood molding, about ¾” high (I used 1” square molding, but you can also use ¼” rounds.) Frame the inside of the window space, creating a vertical angle outward (10 degrees is sufficient) at the top if possible. Make sure to leave enough room for the thickness of the glass, plus another piece of molding. Add in the thickness of insulating material (we’ll be using neoprene) and double it. Example: If your wall is 1’ thick and you’re using ½” thick glass, you want the top (if it’s angled) of the inside frame to be no less than 2¼” from the edge: ¾” molding, plus ½” neoprene, plus ½”-thick glass, plus ½” neoprene, equals 2¼”. Buy ½” thick by ½” to ¾” wide closed-cell neoprene rubber with an adhesive backing. Measure the entire perimeter of the window and multiple by seven. This will give you the total length of rubber you need for both panes. (You’re going to surround each pane three times; multiplying by seven gives you enough for backup.) Now you need to know how thick the glass on the side is going to be. (It’s best to use two different thicknesses, such as ½” and 5/8”, so that they won’t have the same resonant frequency.) You’ll be cutting neoprene for the edges of the glass. The idea here is to totally sandwich, or float, the glass between the rubber, so that the glass is isolated from the wood. Take the neoprene and run it along the outside of the molding facing you. Make it neat and tight. Next, take the neoprene of the same width as the glass and run it along the wood frame at right angles to and butted up tightly against the neoprene you previously put down. The glass will rest on this rubber. You’ll probably need to maneuver the glass a bit to fit it into this rubber frame. Next, you’ll have some previously cut molding to match the same lengths as the molding you just used to frame the glass. Carefully attach neoprene to this molding and screw the molding into place, butted up tightly against the glass. Repeat the procedure for the other piece of glass. Here are a few tips that will help you with the installation. – Make sure you clean the glass thoroughly before mounting it. Fingerprints or smudges on the inside of the glass will drive you crazy. – If you’re staining the molding, make sure you do it before you start attaching the neoprene. – If you want a felt look inside the window, one inexpensive and easy way to do this is to get some Styrofoam board, cut jt to the dimensions that you need (usually the space between the two pieces of molding), and wrap the felt around it. You can use adhesive pray to make the felt hold fast to the Styrofoam board. Frame the inside of the window with it, but make sure it’s attached properly on all sides—you don’t want the top sagging in the middle six months later. Use screws to attach the molding to the window frame. This way, if you need to get in there for any reason, or if a mic stand goes through the window and you need to replace the glass, it’ s much easier to remove than if it was glued on or attached with nails. The cheap and easy way is to get some more of that closed-cell neoprene, and put it around the threshold of your door. A better way is to remove the existing molding from around the inside of the door and replace it with some thicker I” square molding. Put some thick neoprene around the inside of this with enough clearance to close the door with a gentle push, compressing the neoprene slightly and creating a snug frt. The more expensive but better way is to contact a company called Zero International (www.zerointernational.com), which makes great seals for doors. Besides the rubber for around the sides, they also have a bar for the bottom of the door. When the door is closed, this bar lowers automatically, pressing the rubber to the floor and completing the seal.